Where would we be without the wonderful Poster Girl to keep us all up to date with the hottest new Europop tunes? 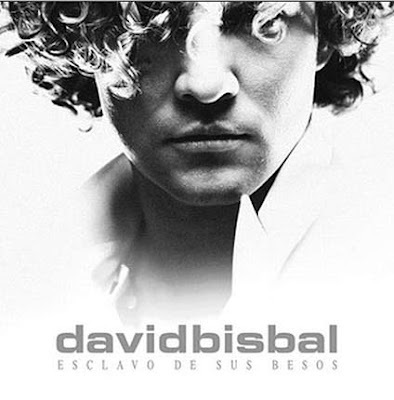 So... all I can say is thanks once again for bringing new material by David Bisbal to my attention. I also got the "Silencio"-vibe from "Esclavo de Sus Besos" which I liked on first listen (and I usually don't like many songs on first listen) - it's a very nice and catchy uptempo Spanish guitar-pop tune and further proof that he's moving away musically from the Latino sound which made him famous. The new album "Sin Mirar Atrás" will be released worldwide on 20.10.2009. ...expect a few of these on various websites towards the end of the year. One of these is starting early: http://nollnolltalet.se/ (in Swedish) is doing a very detailed rundown and I recommend it (thanks to It's A Trap for the link). I haven't really thought about doing a "songs of the decade" rundown but I'm kicking around a few ideas at the moment so I'll probably do something towards the end of the year, in addition to the 2009-50, which is rapidly filling up! It's not the first time I've featured Mr Leer on Retro Saturday - he's been here before as one half of the sublime late 80s duo Act - but I often find inspiration for this feature when my mind takes a little wander through the past, and so it was again this week. I remember receiving Cherry Red's excellent "Pillows and Prayers" album as part of my 1982 Christmas present bonanza - extremely good value for 99p, back in the day, and featuring a wide variety of acts signed to that label. If they all appealed to you, then congratulations on your ear for musical diversity! - anyway I enjoyed a fair amount of them and I thought I'd feature some of the tracks tonight. "All About You" by Thomas Leer is a very wonderful (and overlooked) electro-ballad which still sounds as fresh, and as touching, today. I don’t know, but a week can be a long time in the world of music. As if the continuing Sugababes game of line-up musical chairs (Jade "It’s My Time" Ewen in, last remaining original member Keisha Buchanan out) and the earth-shattering news of the Chas and Dave split wasn’t enough, now here is a strange one. Regular readers of this blog will know that I’m a big fan of Aussie duo Empire of the Sun, so I’m somewhat perplexed by the news that one half of the band, Nick Littlemore, has allegedly been "missing in action" for five months and will not take part in the band’s forthcoming debut live shows in Australia. Singer Luke Steele told an Australian newspaper that he has been left "holding the baby" and that he will be backed by a group called The Swiss for the live shows starting this weekend. Where all this leaves the future of Empire of the Sun, nobody knows. 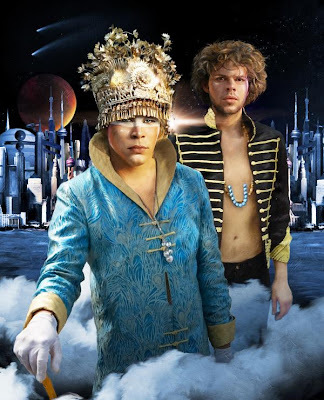 It would be a shame if Luke Steele didn’t continue with this magical musical adventure though. Hello again...I'm back from one of the best holidays I've ever had, in the lovely Turkish resort of Icmeler. Got back on Tuesday morning after a bit of a marathon final day/airport delays/night flight, but caught up with some sleep in the afternoon and should be back on track tomorrow. Went on some very good trips/activities, ate brilliant food all week, and enjoyed the warm Turkish hospitality which truly deserves its good reputation. And let's just say I fell in love with many of those lovely Turkish men...! As usual I'll be publishing my holiday diaries/holiday hit list on here over the next few days as I'll have a bit more time - yes I have almost another week off before going back to work next Tuesday, so expect some regular posts between now and then. This blog is now taking a break - the reason being that I'm off to Turkey tomorrow for my summer holiday (with faithful travelling companion of course)! I'll be back on here on the evening of Tuesday 22nd September - in the meantime if you wish to leave any comments on any of my posts I'll respond to these when I get back. I seem to be stuck in the late 70s at the moment....so while we are on some classic hits from that era let's feature the mighty "I Love The Sound of Breaking Glass" which made the UK top 40 during that new wave of post-punk: audio version at http://www.youtube.com/watch?v=xn0cuAYC5jk&feature=fvw although there are also some live versions at YouTube too. Remember this? "Really Free" by John Otway and Wild Willy Barrett no less. "Cor baby, that's really free!" From 1977, and one more reason why we miss Top of the Pops so much. Starting off tonight with a genuine 90s international one-hit wonder from New Zealand band OMC - "How Bizarre" was a (now forgotten) hit back in 1996 and it still sounds refreshing today. It pops into my head from time to time and tonight I thought it would be a good candidate for Retro Saturday. When was the last time you heard this on the radio? Hallelujah! Swedish Idol is back. The freaks, the geeks, the deluded and the just plain daft....yes it can only mean one thing, the audition stage of Idol 2009 (TV4) kicking off its sixth season. Yes of course there may be some genuine talent but let's forget about that and focus on the undisputed greatness of Philip Damberg, whose version of "Ring of Fire" had me almost collapsing with a fit of the giggles for about half an hour...and will probably have Johnny Cash spinning in his grave. Also worth a mention: Sami Piipanen's, um, enthusiastic "Boten Anna", and Sebastian Rönnberg's, um, less than enthusiastic "To Be With You". You know how certain songs should be banned from Idol auditions? Well can we ban "Hallelujah" now? (Having said that, I thought Joseph Assaly's version was rather nice). Jon (who sang his own composition) seemed to be a big hit with the jury. I was trying to think who he visually reminded me of....and then it just came to me - Stefan Raab on ESC singing "Wadde Hadde Dudde Da"!!! ...Swedish reality/talent television and Melodifestivalen hasn't escaped my notice. Further proof is the line-up for the forthcoming series of the hugely successful TV4 series "Korslaget" which is back to brighten up our autumn weekends from 3rd October. Auditions for the hometown-teams are currently taking place in Sweden: more at www.tv4.se/korslaget. All except one of this year's choir leaders have been in Melodifestivalen - Caroline af Ugglas, Roger Pontare, Ola Svensson, Andreas Lundstedt, Amy Diamond, Rodrigo "Rigo" Pencheff - only Stefan Nykvist from Larz-Kristerz hasn't (yet) but his band of course won another reality-talent show "Dansbandskampen". Talking of which, there will be a new series beginning on 24th October on SVT -expect the Swedish tabloids to get excited about another Saturday night ratings battle between SVT and TV4. Thanks to the internet, we'll be able to watch both shows. Can't believe I haven't featured this on here during the last 2½ years that I've been doing this blog - it's one of my most favourite songs ever and I'm probably the only person I know who has heard of it. Keeping with tonight's theme, it's from 1978 of course. So in a completely random way I've made a spontaneous decision that tonight is 1978 night on Retro Saturday!! One of the members of Eye to Eye was Julian Marshall who was half of the duo Marshall Hain - they had a UK hit with "Dancing in the City" in 1978: http://www.youtube.com/watch?v=1Lmfpnv_eLY - hard to believe this was 31 years ago! !